Located at Bangkok Busiest Shopping Street. Behind the existing City Complex Pratunam (CCP) building and within walking distance to Baiyoke Hotel, Mangkorn Thong Plaza and Maruay Plaza, City Square is of an excellent location which is built right inside the enclave of the bustling wholesale market. The guaranteed returns for City Square is 8% for 2 years. After 2 years, owners can seek city complex management to manage the lease at the prevailing market rate but owner have to pay 1month commission to the management. Strong demand is greater than supply in Pratunam wholesale and huge transaction is transacting everyday business to business. 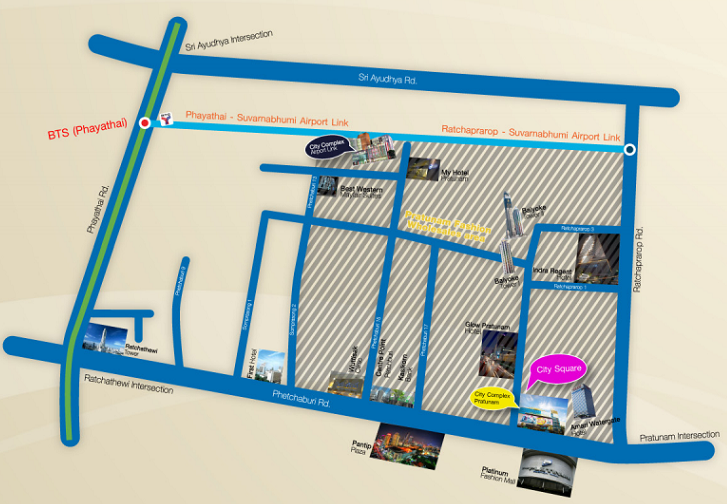 City Square @ Pratunam – A premium commercial development by City Complex Group. Consisting of total 4 levels, 140 commercial units approximately , City Square is a project with 60 years leasehold.